The Rocket Launcher fires explosive un-guided missiles toward which ever it is pointed at. The Rocket Launcher uses 200mm Missile Container for ammo. While the large rocket launcher can be reloaded via conveyor port at the back, the small version cannot be automatically reloaded via a conveyor port - lacking the large conveyor port necessary. 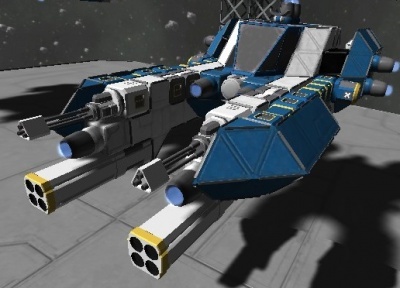 For small ships, the Reloadable Rocket Launcher is available which has a large conveyor port allowing it to reload and retrieve ammo from nearby Cargo Containers. Unlike the small block rocket launcher which needs to be loaded manually from the front, once it's ammo has been expended. The yellow stripe should be facing the front when placing the block. Bad things will happen if the yellow is mounted towards the ship, as this is where the rockets come out when fired. These rocket launchers are only good for saving space. If you are entirely dependent on missiles, use Reloadable Rocket Launchers instead. 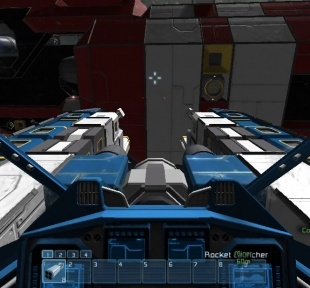 As of December 2014, on dedicated servers, firing this weapon while moving forward even slightly will cause the rocket to spawn behind the launcher destroying itself and other parts of your ship. Also, there is typically a 7 second detonation delay on a populated server rendering rocket launchers useless for hitting moving targets. This page was last modified on 19 March 2017, at 00:15.